It’s not always easy to engage a large audience interactively in a learning session. Yet we know that active learning and engagement improves understanding, prompts reflection, provides feedback so that the tutor can tune the content of the session, and has many other positive effects on learning. Asking questions however, can mean only a few students get to respond. With more than a few students it isn’t possible to have an effective student-tutor dialogue. Small group work is not often practical in a lecture theatre or with large numbers and limited time (for example it’s very difficult to collate all the group results in a short time). It can seem as if there is little possible with large audiences but to fall back on pure delivery model with the student in a very passive mode. Using a response technology, personal response system or audience participation system to get students or audience members to vote (or to comment) has many advantages and there are a number of feedback or voting or response technologies available. Many have the fun feel of the “Ask the audience” option of the TV programme “Who wants to be a Millionaire?” and certainly engages students, but for me, one of the most important outcomes of their use is the ability for the tutor to pinpoint exactly where gaps in student knowledge exist – where students are failing to learn – to be able to target these. A useful overview “Using Personal Response Systems (PRS) to introduce interactivity to your lectures and tutorials” with links to examples and case studies can be found at the University of Aberdeen while Steve Draper’s “Electronic Voting Systems and interactive lectures” web pages are also very helpful. One such technology is an electronic voting system such as Activote (Promethean), TurningPoint – Interactive Response System or EduCue / Interwrite iPRS (Personal Response System). There are several similar products available. 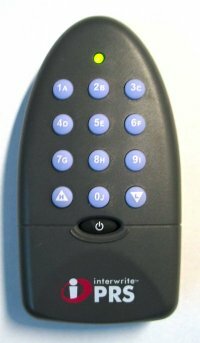 The handsets are often known as clickers or zappers. Using the students’ own mobile phone can also be an option, e.g., Swarmteams technology, http://www.polleverywhere.com/, Mobile technology – proximity push and voting/polling on Android and, of course, as more and more students have internet-ready mobile phones and laptops in sessions, Twitter. Whatever the system used, adding interactivity to a lecture or presentation to a large audience will mean that they won’t forget what you’re saying in a hurry, but it does require an investment in preparation and time to understand the pedagogy of personal response systems.